It’s Washington vs. Burlington in the Parking Madness 2016 Tip Off! 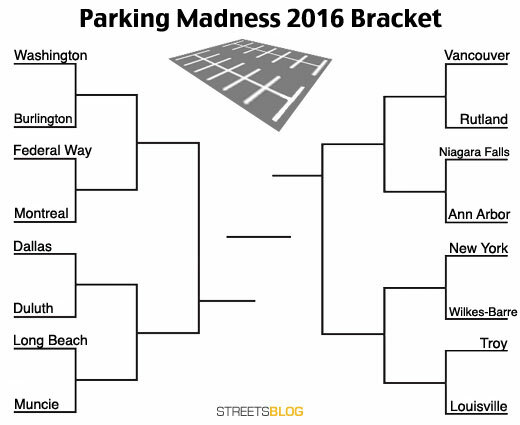 Welcome to Parking Madness, Streetsblog’s annual Sweet 16 tournament of parking craters. What’s a parking crater? Simply put, it’s a depression in the cityscape, a void where car storage has usurped land that should be devoted to buildings. This is the fourth year Streetsblog readers have submitted more than enough entries to field a 16-crater bracket. Thanks to everyone who nominated a crater — if we could accept them all we would, but there are just too many downtown parking scars to put them all in the competition. Entries advance through the tournament by beating other parking craters in a reader vote. 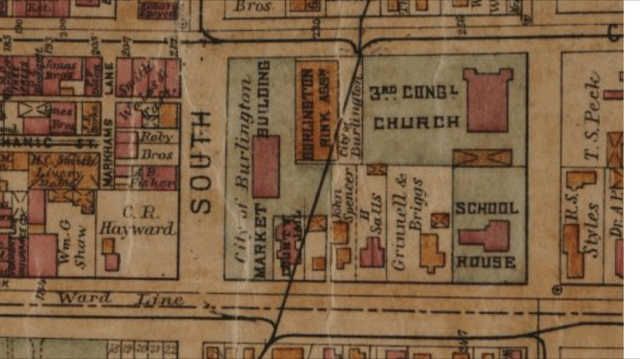 Today’s match-up is practically ripped from the headlines: Burlington, Vermont, where Bernie Sanders served as mayor in the 1980s, goes up against Washington and the parking crater at the epicenter of the American political establishment. 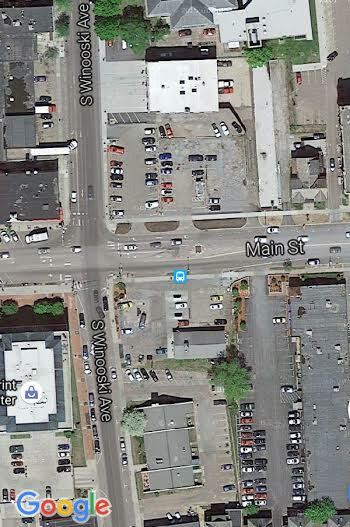 Here’s an overhead shot of the area where Main Street meets South Winooski Avenue. Burlington’s Main Street is a key access route from the University of Vermont, the highway exit, and points east of town to the vibrant downtown and waterfront areas. Traveling west towards town you are heading downhill on Main Street with a great view of Lake Champlain and the Adirondack Mountains on the horizon. Unfortunately the entrance to downtown where Main Street intersects South Winooski Avenue is a complete eyesore, with a gas station, seedy motel, and (to the point here) a large surface parking lot. The parking crater, and the intersection as a whole, is in stark contrast to the bustling Church Street pedestrian marketplace nary a block away. Suffice it to say, that land could do a lot more for residents and visitors in some mode other than a surface parking lot. This may not be as big as some others, but it’s particularly heinously located. 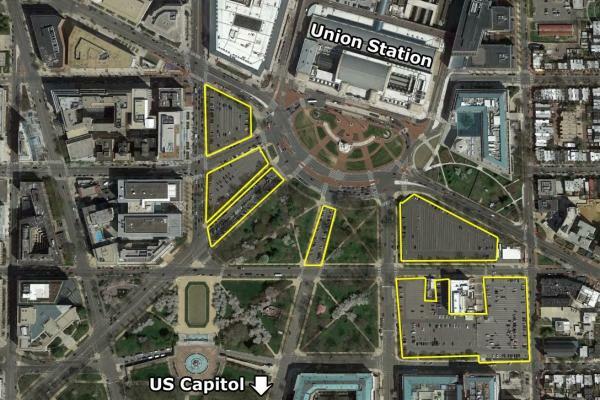 In a city with barely any surface parking lots, 4 entire blocks worth of them (plus some full-converted-to-parking streets) separate Union Station, America’s second busiest train station, from downtown DC and the US Capitol. 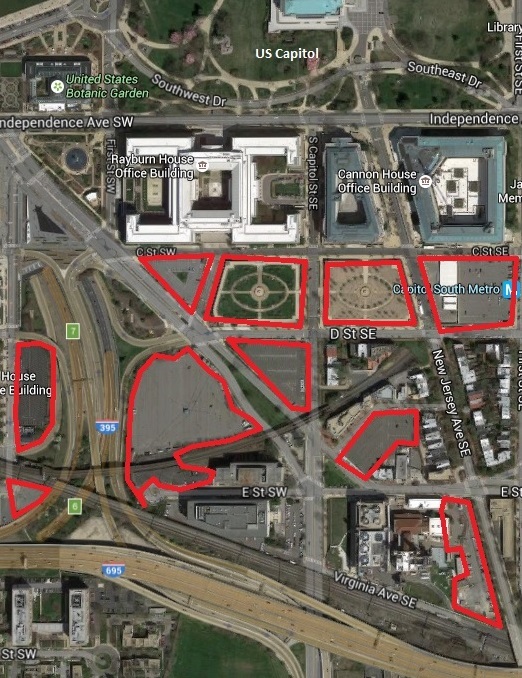 The lots are federally owned and are for the US Capitol complex, so there’s nothing anybody can do to fix them. Developers can’t buy them, and the city can’t tax them into submission. It’s absolute parking madness. Selling off these parking lots, at today’s historically high market valuations, would raise $230 million for the federal government. That could pay for two entire years of the federal government’s bike/ped program! All right, now it’s up to you to tell us which one deserves to advance to the next round. Come back tomorrow and every weekday for the rest of March to get your daily fix of parking crater face-offs. Which parking crater is the worst? I ultimately voted for DC but Burlington really came to play. DC’s is bad mostly because of the imagery – Congressional staff parking for free in a prime location while the rest of the city is starved for viable real estate. But at least the rest of the downtown/core is fairly free of such parking craters. I already find parts of DC hard to walk in due to the monumental buildings and spaces (which are nice, but really spread things apart!) and so much government use which kills much of the city during non-office hours, so I figured a chunk of empty space doesn’t change things _that_ much. Therefore I feel sadder for Burlington, which got my vote. In terms of being a source of local, national & international embarrassment and an incredible waste of land, DC’s parking crater wins hands down. It’s truly heinous, occupying extraordinarily valuable land in what should be the heart of the city. Real estate developers are so starved for land to develop in the area that they are in the process of paying to deck over a freeway to create more land to develop. There are also plans to deck over the railroad track just north of the same station to also create more land to develop. Meanwhile there are zero plans to develop these craters because they are controlled by congress. Go figure. DC has gotten a lot better regarding parking lots, especially in ares like shaw/logan/noma over the past 30 years. But its shameful that there are still trouble areas like this. Burlington’s is pretty bad, but I voted for DC due to the location. That is in the HEART of the District, outside one of the nation’s busiest train terminals, and with the WMATA MetroRail Red Line just steps away. It is unbelievably inappropriate to have so much parking in that location. So Burlington, yeah — this is a city that takes 15 years to figure out what to do with a municipal bus terminal in a state that has taken 30 years to figure out what to do with a circumferential highway that has partially been built and is currently rotting in the sun. My point is that with that kind of lunacy, perhaps Burlington should be getting more votes! I think someone needs to make the point to this city that the real world doesn’t operate like this. Burlington (or Vernont in general) isnt part of the real world. Just don’t tell anyone who lives there, they think that Vermont is better than the real world. And people I know wonder why I prefer Manhattan to Burlington. DULUTH. The reason it gets my vote is that this city has so much going for it as a city that is surviving it’s rustbelt heritage and its Tundric latitude, it has become a slowly growing center for high tech jobs and sits on a very unique chuck of the Canadian Shield. However, the hospital systems which are positioned right downtown are eating up ever increasing blocks for their 9-5 parking. These are not empty blocks being paved over but rather neighborhoods of amazing architecture. This is the largest, but by no means the only, one in the city – the Essentia Health Campus. Sorry but Burlington from the birds eye really looks like a tidy, dense city with very few craters, a viable pedestrian area and good linkages from campus to down town. Am I missing something? That intersection made me a lot less enthusiastic about UVM when we did a college visit there. A lot of downtown Burlington is charming, but it’s not a great walk from campus. Let me guess: Members of Congress from Texas and Idaho and similar places are responsible for this crater. Actually, the pattern in DC is that portions of the city under the control of the city council are free of parking craters — but those under the control of Congress are parking craters. No surprise, eh?